Remember to tip your server well. These six words are brought to you be the Pastor who stiffed a server on a tip with a not so Christian message. 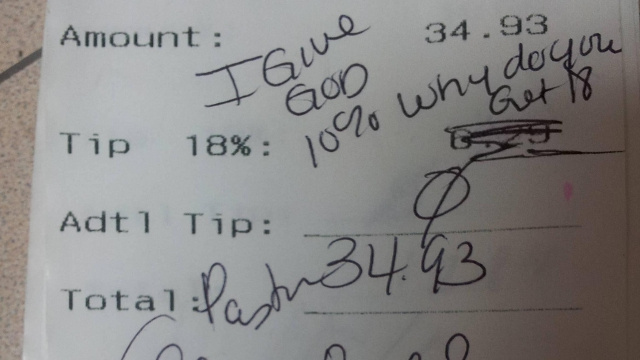 The server's co-worker than posted the bill to Reddit and embarrassment all around ensued. Privacy in the HTM industry is paramount all around. Breaking that cardinal rule will get you fired however; there is some justice here posting this sanctimoniousness Pastor's lack of etiquette. To read the whole story click here. I hadn't heard of this story before so I read with interest.Sounds to me like both the people concerned got into something they didn't expect! Absolutely! I know you mean all of them! Ha ha ha! It's a thankful day !! !